Yum, what could be better than a nice crisp piece of buttered toast first thing in the morning? If you don't like standing by the stove watching and waiting for your bread to turn brown, an electric toaster could be just the thing for you. You probably know that a machine like this turns the power of electricity into heat that can cook your bread in a jiffy. But you do you know how the electricity that flows into the toaster gets transformed into a totally different kind of energy? Let's take a closer look inside. 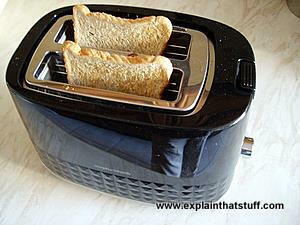 Photo: An electric toaster takes in electrical energy from the power outlet and converts it into heat, very efficiently. If you want your toast to cook quickly, you need a toaster that radiates as much heat as possible each second onto your bread. For that to happen, according to the laws of physics, it needs to consume the maximum amount of electrical energy per second. In other words, it needs the highest power rating (wattage) you can find. A toaster with a higher watt rating will invariably cook more quickly than one with a lower rating. Energy is a kind of magic, invisible substance that lets you do things. Heat is one kind of energy and electricity (generated by power plants and stored inside things like batteries) is another. You can't make toast by standing a slice of bread on top of a battery—and nor should you try! But you can make toast with electricity if you use an electric toaster. So what's the difference? If you've ever looked down inside a toaster, you'll have noticed rows of glowing red wires facing the bread. When electricity flows through these wires, they get hot and then fire their heat toward the bread like dozens of miniature radiators. WARNING: You must never ever touch these wires (which are called filaments or elements), either with your fingers or with any other object, because they are dangerously hot and carry large electric currents that could zap through your body, electrocute you, and kill you. If you need to remove some bread stuck in a toaster, always unplug it first. When electricity flows through a wire, energy is transmitted from one end of the wire to another. The movement of energy is a bit like water flowing down a pipe. The electrical energy is carried down the wire by electrons, the tiny particles inside the atoms of metal that make up the wire. As the electricity flows, the electrons jostle about and collide with one another, and with the atoms in the metal wire, giving off heat in the process. The thinner the wire, and the greater the electric current, the more collisions happen and the more heat is generated. What happens inside a toaster? Electrical energy flows into the toaster from a wire plugged into the domestic electricity supply. The electric current flows through a series of thin filaments connected together but spaced widely enough apart to toast the whole bread surface. The filaments are so thin that they glow red hot when the electricity flows through them. Like a series of small radiators, the filaments beam heat toward the bread in the toaster. The steady supply of heat rapidly cooks the bread. There are filaments on each wall of the toaster so the two sides of the bread cook at the same time. Old-fashioned electric lamps use this trick to produce their light. Inside their large glass bulbs, they have a filament made from an incredibly thin piece of coiled wire. 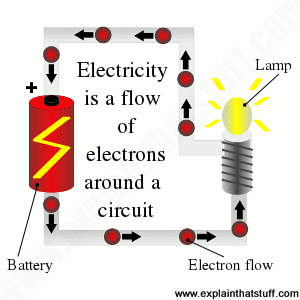 When electricity flows through the filament, it becomes extremely hot and produces both light and heat. 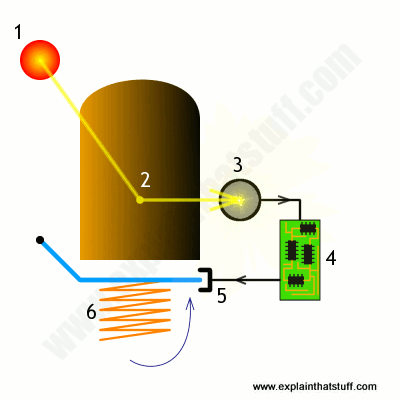 Making light by heating something up in this way is called incandescence. Incandescent lamps waste most of the electrical energy they consume. About 90 percent of the electricity in a light bulb like this turns immediately into heat, which is incredibly wasteful. That's why many people are now switching over to energy-efficient fluorescent lightbulbs, which produce just as much light without producing heat. In a toaster, the opposite is the case: we're obviously much more interested in producing heat and the small amount of light produced by the glowing filaments is wasted energy. Appliances such as showers and kettles that heat up water with electricity have to do it in a safe way to ensure they don't electrocute you. Instead of using a thin bare wire (like the ones you can see inside your toaster), they use a different kind of heating unit called an element, which has the bare wires safely contained inside it. 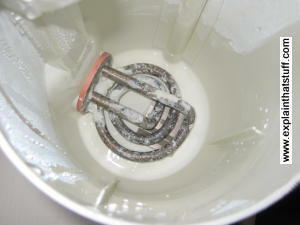 The element is the shiny curved piece of metal you can see at the bottom of an electric kettle. Don't ever attempt to touch it because you'll burn or otherwise injure yourself. 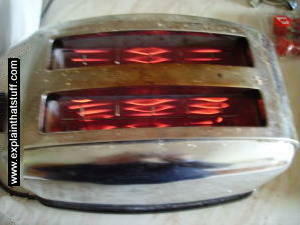 Photo: 1) The glowing elements inside a toaster. 2) You can clearly see the coiled electrical element at the bottom of this kettle. As electricity flows through the thick metal coil, electrons inside make the metal heat up and that heat is rapidly passed onto the water inside the jug. How do toasters know when to switch themselves off? 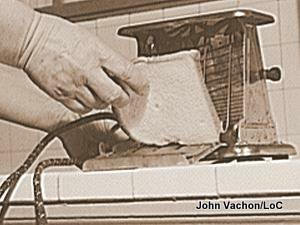 Photo: The first electric toasters didn't switch themselves off: they were completely manual. You put a slice of bread in a pivoting metal toasting rack and closed it up so the rack stood against a bank of heating elements. When you could see or smell that your toast was done, you opened the rack, lifted the bread out, and put it back in the other way to toast the other side. Automatic toasters were a later development. A wartime photo from 1943 by John Vachon for the US Farm Security Administration/Office of War Information courtesy of US Library of Congress. Your toaster most likely uses either a timer or a thermostat to switch itself off when your bread is done, but some sophisticated models use electronic light-detector circuits based on photoelectric cells. It's reasonable to assume that most people always use the same kind of bread, sliced in a similar way, so their toast will usually take about the same length of time to cook. A simple clockwork or electronic timing circuit can be used to switch off the heating element after a certain period has elapsed. With this kind of toaster, turning up the control simply extends the cooking time. A thermostat is a mechanical, electrical, or electronic device that switches an electric circuit on or off to keep something (perhaps the room where you're living or the ice compartment of a refrigerator) at a fairly constant temperature. We can also use it to switch a toaster off when the bread is cooked. Suppose there is a bimetal-strip thermostat (two different metals welded together) fitted very close to a toaster's heating element. The thermostat will heat up as the bread cooks and the metals will expand by different amounts, so the thermostat will gradually bend into a curve. When the right temperature is reached, it will bend just enough to snap open and switch off the toaster's heating element. In this kind of toaster, turning up the control adjusts the distance by which the thermostat has to bend before it switches off the heater. Photo: Olving's photoelectric toaster used four modified heating/lighting elements (red circles) to do the cooking. Light reflected from the bread (brown) was collected by a lens (yellow) and bounced down through a prism arrangement (light blue) to a photocell (dark blue) at the bottom, then amplified by some rather ancient electronics (green) to produce an electric current that would flip up the bread once it was done. Artwork courtesy of US Patent and Trademark Office. A photoelectric cell (or photocell) is an electronic component that generates electricity according to how much light falls on it. Suppose you build your toaster with a miniature flashlight inside it, shining at an angle towards the bread. As toast slowly cooks, the bread effectively turns from white to brown (hopefully not black), so the light reflected off it should slowly decrease in intensity. Place a photocell nearby to measure the reflected light and, in theory, you have an accurate means of figuring out when your toast is cooked that's much more reliable than timers and thermostats. Sounds like science fiction? The oldest toaster I've found using this idea is described in US Patent 2,631,523: Automatic electric toaster, granted in 1953 to Bror G Olving and the McGraw Electric Company (though there might have been earlier ones). When timers and thermostats switch off a toaster, they generally also release a spring that pops up the metal cage holding your toast. It's much easier to get your toast out if it pops up. It's safer too because the inside of the toaster is usually much too hot to be reaching into—and, as we've seen already, you don't want to touch the filaments! The Toaster Project: Or A Heroic Attempt to Build a Simple Electric Appliance from Scratch by Thomas Thwaites. Princeton Architectural Press, 2014. A fascinating, witty look at how everyday products are made: Thwaites builds himself a toaster from the most basic, raw ingredients (steel, mica, plastic, copper, and nickel). Troubleshooting and Repairing Major Appliances by Eric Kleinert. McGraw Hill, 2012. A good fix-it guide aimed at competent and confident electrical DIY enthusiasts. Although it doesn't cover toasters explicitly, there are sections about general electrical principles and common parts such as thermostats and solenoids that may be helpful and relevant. The Toaster: A Module on Heat and Energy Transformations by Bruce B. Marsh and Carl R. Stannard, American Institute of Physics. McGraw Hill, 1975. An old but interesting booklet that covers how toasters convert electrical energy into heat. Also explains the thermostatic control system that switches a toaster off. Toasters by Elaine Marie Alphin. Carolrhoda Books, 1998. A basic 48-page introduction to toasters, how they work, and who invented them. The Self Buttering Toaster: Wired, May 18, 2009. There's a value in scientific experiments that push limits.